Book design and character development. Check out the class Ive been taking with Zoe Tucker and Lilla Rogers. Follow my journey of book design and development from sketches, comps, character design and cover. I'm not promising I'm going to have time or thoughts to do this everyday but I'm going to try my best. The class being over is bittersweet. I truly enjoyed the makeartthatsells.com 5 week home decor class. Seeing all the inspiring work from all the students pushed me to think differently and try more. The last week was working with wood. I decided to do a clock, a dresser, coasters, cutting board and egg cups. I've always loved pottery. Infact I have quite the collection building of handmade pottery from Ireland and the U.S. I was very excited about this weeks class. However the week ran away from me and I was left with just my sketches and a day to work on some type explorations and ceramic styling. So here it is. There was more in the sketchbook than made it to the page but here is where I netted out. 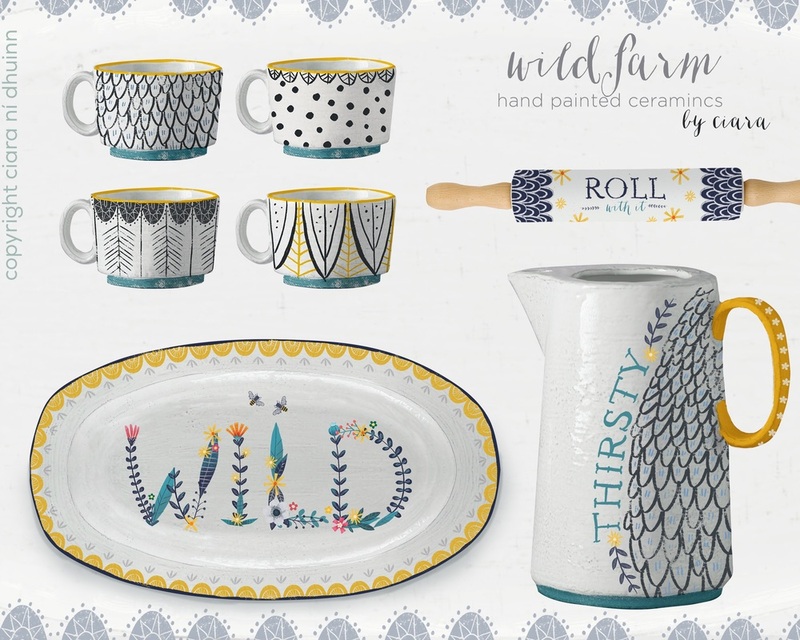 Wild Farm hand painted ceramic collection. Handmade ceramic mugs- finishing style handpainted and sealed with a gloss. Detail of cups using feather details for inspiration. Foxy Fables of False Flattery. Sign up for some pretty pictures. People that both inspire and drive me as a creative and illustrator.